Mulching Saves Water & Reduces Weeding! When the sun is out & the weather is warm, the thoughts of gardeners turn to helping their plants to survive a potential drought! Brief showers are all very well, but don’t really provide enough moisture to help thirsty plants get through dry periods. And vegetables, especially cucurbites like courgettes, and other moisture-hungry plants won’t grow without plenty of moisture. So if you don’t water, you won’t get a decent crop. However, most of us are sensitive to the issue of using lots of water on the garden. So is there a more environmentally sound way of managing your vegetable growing without having to turn on the sprinkler every night? The answer is yes. Mulching your plants well will help the soil to retain moisture, and mean that you need to water less and do less weeding!. It will also help to suppress weeds, which will mean that your plants don’t have to compete for water in quite the same way, and again will therefore need less. But beware: if you haven’t already mulched and the ground is dry, mulching will keep out the moisture. At this time of year, mulching is a two-stage process. This doesn’t just mean that there has been a shower of rain. The ground needs to be really wet. If you haven’t had a decent downpour lasting at least a couple of hours in the previous day, then you’ll need to get out the sprinkler and leave it going for an hour or so. The ground needs to be wet down to about 10cm. You can buy bark chippings or wood chip, or even play bark, from bark suppliers. Most of them will have a calculator to help you work out how much you need to cover your ground. But as a rough guide, scientific studies have shown that wood chip or bark chippings spread to a depth of about 5cm is effective in helping plants and soil to retain moisture and suppress weed growth. So make sure that you put it on thickly. Obviously, if you’ve already got small vegetable plants in place, you don’t want to swamp them, so be careful how you mulch around them. You may need to make the mulch slightly thinner around them to start with, and build it up as they grow. 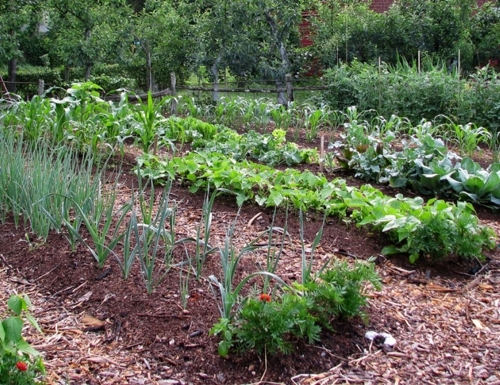 Once safely mulched, your vegetable plants will be better placed to survive dry conditions. But be aware that mulching is not a complete substitute for watering. You will still need to water periodically in dry patches, and now you’ll need to water for longer to make sure that the water penetrates the mulch and gets to the plants’ roots.